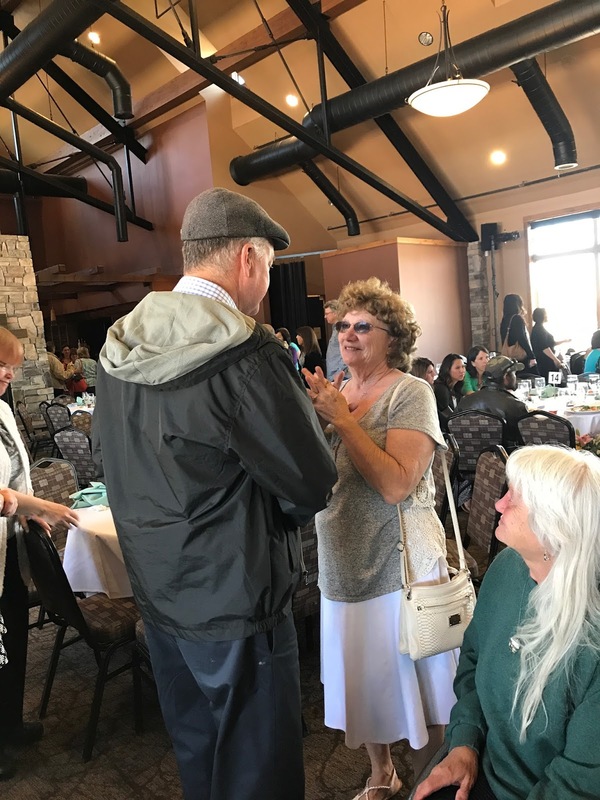 Recently I was asked to speak at a donor family celebration in Reno. Each year Donor Network West honors the families of those, that in their passing, became organ and tissue donors and thereby saved and improved the lives of countless people and their families. As I reflected upon this miraculous blessing in my own life I thought back on all of the moments and memories that I have had in these past nine years. I have seen 7 grandsons born, we have traveled the world and found countless natural and cultural discoveries, both at home and abroad, I was able to return work for eight years and thereby helped in curing cancers and improving countless lives. I still spend every day with the love of my life, which is the best gift of all. I wrote a book. I became a pilot. So many more moments of beauty communing with nature and communicating with others which are innumerable; all because of a heart. Memories continued to pull me back. I was laying in pre-op at Stanford University Friday evening on August 15, 2008. The last beats of my old heart counting down the seconds with just over 14,000 remaining. A nurse informed me that my new heart was on its way from Reno. The only information that she could share was that he was 6' 2" tall - my height. I began to think about the terrible grief that must have overcome his family. But I had to focus on the moments just ahead of me. I was not afraid at all. This was the most right of all moments. How often do we get to remember the moment just prior to being born? I was so happy. The next morning I woke up, what an understatement. Consciousness; I was me again. I felt indescribably infinite gratitude. I was luminous. Three days later was my 49th birthday. As I laid awake in the darkness as my thoughts returned to my donor's family. All I wanted to do was thank them, I wondered if that could ever happen. In my mind I wrote the following blog and posted it a week later. August 15 was the day that two worlds were uniquely united, and at the coeur of it all, a heart. This heart had already lived a lifetime in my donor. Each beat becoming the sum of his existence. Altogether they wove a tapestry of color and life that reflected all of his joys and sadness, his longings and toil. The heart was his witness and his strength, unfaultable in marking each moment, constant. But then, the unthinkable occurred, and as his life silently slipped away, his heart kept going, awaiting a new life. 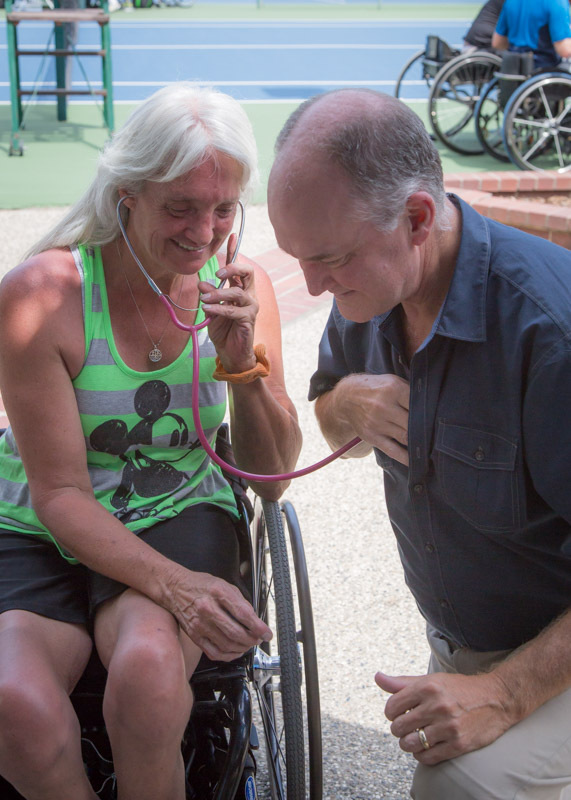 In that moment, my donor made the ultimate final gift, his heart to me. My own heart has served me so well. I have experienced more joy and fulfillment in one lifetime than most men would have in three. But my heart was worn out, ravaged by disease and struggling daily to keep me going, and soon, it had marked its last beat. While I lay there on the operating table, for at least an hour, I had no heart inside my chest. My survival was maintained only through machines and technology under the skilled hands of committed doctors and nurses. And then, his heart was placed inside me, and my life began again. I had a new heart, but it is not completely mine, nor will it ever be. For it is a shared heart. This shared heart has already lived a lifetime and must be remembered as such. This must be why I have the strong desire to hug everyone. A hug, in such a simple act, can bring two hearts together, marking a brief moment of friendship. I feel like I should share my shared heart with others. I will honor the memory of my donor by offering his gift to others with a hug. Two things that heartbeats and hugs have in common are that they are both strong symbols of the importance of being in the present. Past regrets and future concerns have no place in the moment of presence. What I have learned from all of this is to cherish the present. My dream is that someday, if allowed, I may meet the family of my donor and through the simple act of a hug, reunite them with him, one more time in the present. In memory of my donor and his family. I finished my remarks and the meeting ended with a video remembrance of each donor whose family was present that day. This was a week ago Saturday. 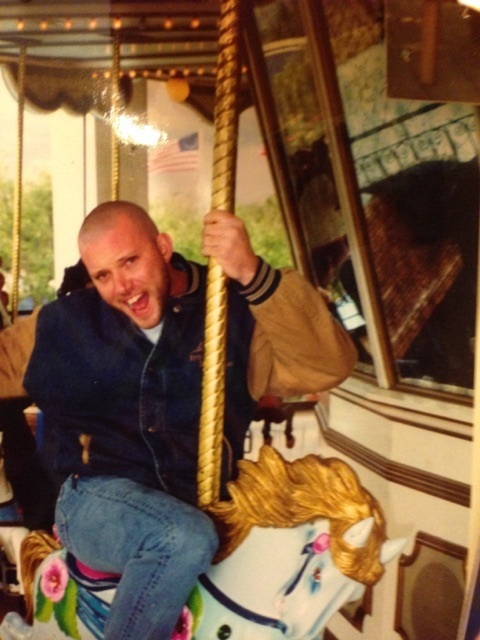 The first photo was of Shane, my donor. I did not expect this. I had met Shane's aunt 2 years ago after she had contacted me wanting to meet Barbie and me in Roseville, CA, however, st that time, Shane's parents were understandably still not ready to cross that emotional bridge. 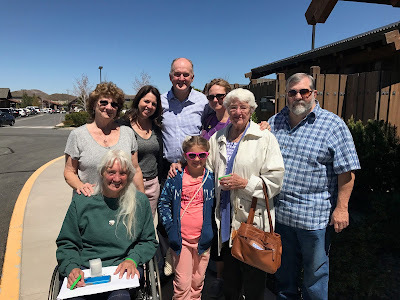 A week prior to the Reno donor celebration I had invited Shane's aunt, Patty, to come to the meeting, Through Donor Network West she had his photo included in the video presentation. As it appeared she then whispered to me, "Bev is coming." I couldn't hide my emotion; would my dream from nearly nine years ago really come true in the next few minutes? The meeting ended and, as I got up to move to the front of the room, I turned around and saw a woman I had never before seen looking at me and smiling. In my heart I knew who she was as she said, "I am Beverly." I quickly moved forward and as I hugged her I said, "I am Kevin. Thank you for my life." In that moment the heart of a son was reunited with his mother. He was home. Barbie was soon at my side, the reunion was almost complete. Within minutes we were joined by most of Shane's immediate family. I met his older sister and her daughter, who was born soon after her uncle's death, his 92 year old grandmother was there, his uncle and finally his cousin who only two years ago received a kidney-pancreas transplant which simultaneous cured his kidney failure and diabetes. We had come full circle, two men, cousins, one a donor and one a recipient; no one can deny the magnitude of the impact of these life altering decisions experienced by this family. We visited for a time, we spoke of Shane, we hugged and then parted ways. About four months ago I met an amazing 92 year man. Since my days as Chief of Urology at the VA Hospital in Connecticut I always ask the same question to men of a certain age. "What did you do in the war?" Which war is always understood based on their age. He replied, "I flew B-17 bombers in the Battle of the Bulge." I excitedly told him that I was learning to fly to which he responded, "Are you a natural?" I said that I didn't know. Today I soloed for the first time. It was incredible and exhilarating. Learning to fly has also been the hardest thing that I have done this side of forty. I was not a natural. Learning to consistently land well took many hours of practice. The intellectual study, physical control and mental focus was immense. It's hard to learn to do something very difficult in your fifties. So often we're just coasting at this point. Yes, I can do difficult surgeries, but I developed those skills in my twenties and thirties. We can still learn new and difficult skills later in life, but you must pay the price and not give in to the momentary disappointments and self doubt. Today I celebrate the opportunity to fly and learn and see the world from a completely new point of view. We are only truly old when we stop learning. I've always wanted to fly but never really considered it an option given all of the other responsibilities that took priority for my time. Then two years ago Barbie gave me a gift of an introductory flying lesson. I was immediately hooked. However, at that time, patients with heart transplants could not get a regular pilot's license. That has now changed but certain chemotherapy drugs also limit ones access to such a goal. Then for Valentine's day I got Barbie an introductory flight lesson. It was so fun to see her pre-flight the Cessna 172 and the take off with the instructor. Soon, to her delight, she was in control of the plane; banking and turning, as we flew over our house. This reignited my desire to fly. It turns out that to fly a light-sport plane a medical exam is not needed. All that is required is a valid driver's license. I began my training in June with California Sport Aviation in Lodi, California, which is a 55 mile drive from Lincoln. My flight instructor is Bill Bardin. We spent many, many hours flying over the Sacramento valley, learning maneuvers and landing. He is a good instructor, but he wants perfection as he feels responsible for the ultimate safety of the pilot and the plane. Many times he would pull back on the throttle and say, "Your engine just quit, what are you going to do now?" And I would scan the earth for a suitable landing area and execute a low approach, (as if I were going to land). I often felt like a medical student again being grilled by the professor. I don't know if any pilot ever gets their instructor's voice out of their head. In a way, I hope not. It seems that all of the really difficult things in life that we learn require a good (and patient) mentor. I was fortunate to find Bill. I was also very lucky in that we never cancelled a lesson for weather or equipment issues. I now feel confident to continue learning on my own. I spent a year during my fellowship with Dr Clayman learning how to do a laparoscopic nephrectomy. But it was only when, at Yale a year later, that I did my first case as the attending that I really felt like the surgeon. This is how I feel today. You can do anything that you really put your mind to. The sky's the limit. The first night after my heart transplant I had trouble sleeping. As I lay awake in the dark my mind drifted to the person whose gift had just changed my life forever. I began to compose a letter to his family in which I expressed my desire to meet them in person so as to give them a hug and bring his heart close to them one more time. It has now been almost seven years and the dream finally came true yesterday. 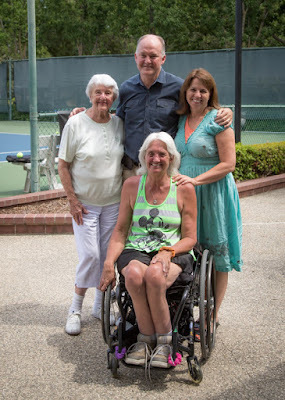 My donor, Shane's, Aunt Patty and his grandmother Gertrude were in town for a tennis tournament. Patty, who is paraplegic, competes internationally and was in Roseville for the weekend. On Thursday we opened the mail to find a card from her hoping to meet us. Shane's cousin had recently received a kidney/pancreas transplant which stirred in Patty a desire to find out about me. I couldn't be more thrilled to meet her and her mother, Gertrude, who just celebrated her 90th birthday. Barbie and I arrived at the Johnson Ranch Tennis Club about a half mile from where I work every day. My emotions were raw and spontaneous as I knelt to give her a hug. They told us all about Shane; about who he was and his personal decision, conveyed years earlier to his father, to be an organ donor. I felt a new closeness to him and to our shared heart. The connection was complete. Words can never convey the gratitude that I feel to him and to his family. When my time here on earth is done, (a very long time from now,) I will find him in heaven and finally know the man that made my continued mortal existence possible. For now, meeting his family fulfills a wish and a dream that has lingered so long. My Grandpa Anderson died in April 1959. I never knew him in this mortal life. However, I believe that my birth 4 months later helped to comfort my parents in their mourning. My earliest memories included the assurance that my Grandpa Anderson knew me in heaven and sent me to my mom and dad. Years later I came across a few documents that he had written. In those few pages I sensed a connection between us; his love for nature, his loyalty and patriotism. How teaching was so significant in his life. Of the sorted photos that we have of him one stands out. He is sitting on his porch, looking out over his front lawn to the mountain which would have filled his view. He is holding a grandchild on his lap. 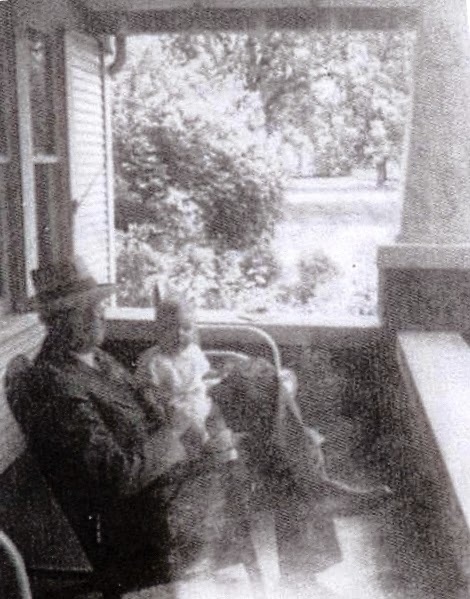 Here I am now, 66 years later, holding my grandson on that selfsame porch in his house which is now my house. Buildings vary so little over the decades. While the people inside and the world outside change faster than we can adapt. Beyond the white picket fence I see the golden washed clouds over Mt Timpanogos as the sun sets to the west. This is a moment. I am now Grandpa Anderson. I belong here. We traveled to Utah last week for the blessing of Luke Daniel Anderson, our youngest grandson born 7 weeks earlier to Samuel and Michelle. All of our children, their spouses and Luke's three cousins came to witness the event. What a joyous reunion it was. We are currently scattered in five states. Four grandsons in one year; what a dream come true. Jamison David Solari, son of Caitlin and Ben turned one this week, followed by Kent Durham Anderson, son of Alexandria and Jeremy, who is 10 months. Then Seth Douglas Hammond, son of Rebecca and Jason, now 8 months old. Sunday arrived and it was time for the blessing which occurs at the beginning of Sacrament Meeting. We encircled Luke with our hands as we stood shoulder to shoulder; four generations. Sam invoked beautiful blessings and promises. As we sat down again in our pews I casually glanced at those around us. With Barbie next to me I saw to each side and directly in front each of our four children and their spouses. On each of their laps sat a firstborn son. I reveled at the amazing beauty of this moment/ Could life ever feel better than this? Then suddenly a surprise. It was announced that the musical interlude would be performed by the Anderson siblings, soon on the stand we heard our children sing together for the first time in many years. Jeremy on bass, Samuel tenor, Rebecca sang the melody with Caitlin on the soprano descant. I was overcome with emotion. To paraphrase Elder Neal Maxwell, "If moments are the molecules that make up eternity, this was a macro-molecule." Is there a happier man than me? I think not. To be present at such gatherings, to return to work full time, to see my grandchildren born and develop. To have a new heart for six year that remains free of amyloid deposits, the wake up and fall asleep next to my true love and eternal companion everyday is more than I could have dreamed of a few short years ago. Some people are thrill seekers. They are into extreme sports so they can get that "adrenaline rush". Yet, there is a certain sense that in taking risks you feel truly alive. I love to experience new things because it allows me to see the world from a different perspective. Ah, yes, the "per" words perspective and perception. These vernacularian twins represent vision divided by reality. What wise soul would not want to increase their perspective, thus allowing them to see the world from different angles, viewpoints, the other side to every story. Since perception is reality, at least at the individual level, the inherent value of fine-tuning our perception through the summation of its angles is immense. Perspective augments perception. Some new experiences require us to step outside of our comfort zone: Trying Thai food for the first time, riding a mule down the Grand Canyon, speaking at a press conference with the Speaker of the California State Assembly. Just jump in, the waters fine. Today Barbie and I spent the day at the California State Capitol in Sacramento. April is Donate Life Month and Donate Life California, of which I am a volunteer ambassador, was tasked to spend two days working as advocates (the non-profit word for lobbyists,) to encourage state senators and assembly members to vote for AB2399 which would facilitate simpler e-registration for organ donation. Barbie and I had no idea that this meant meeting with legislators and their staffers. In one office we met Sen. Berryhill who had a heart transplant 13 years ago. We shared an emotional moment as we remembered the gift and sacrifice of our donors. Finally, at the press conference, it was my turn to speak after the Speaker, Sen Perez (the bill's author). I was told that I had 2 1/2 minutes (oddly reminiscent of junior Sunday School 50 years ago.) Various disparate ideas coalesced into one of the most coherent messages that I have ever given. Even my laryngitis was momentarily transformed into a steady low bass. In essence I shared that the depth of gratitude that we as organ recipients share is beyond preparation. It wells up from the innermost core of our souls and remains a daily reminder of our indebtedness to the kindness of compassionate strangers. 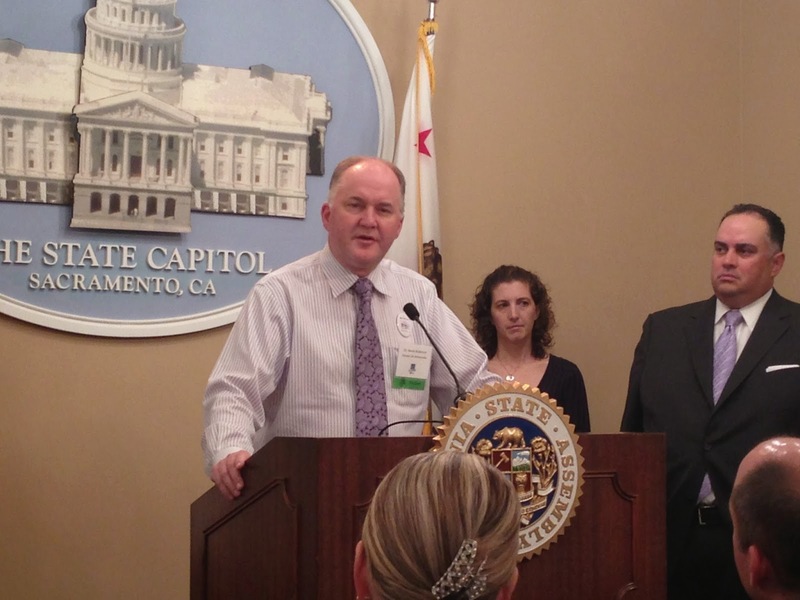 As I finished, the leaders at Donate Life California felt that I had properly shared their vision and their message. I have never experienced, first hand, the inner working of politics. I have new perspective which can now, hopefully, fine tune my perception. "Eat Better in 2014" Catchy title. But this is not a blog on the virtues of vegan existence or grazing on crudites. It is about eating stuff that tastes better. And we all know what makes things taste better: FAT. For Christmas I asked for an A&W Root Beer mug set. (nothing's better than drinking root beer from a frosty mug.) and a Presto Fry Daddy deep fat fryer. Barbie bought the upgraded version with a lid and a basket (still under $25.00). Everyday during the Christmas break my son-in-law, Ben, would ask with child-like exuberance, "What can we fry today?!" We did sweet potato fries with a horseradish fry sauce, corn-dogs, green beans a la tempura (healthy crudites) and even deep fried Oreo cookies. For the record, I used many organic ingredients, even the plastic lid on the fryer and the extension cord were organic, albeit if your definition of organic refers to items composed of carbon-based molecules. Were synthetic fertilizers used on my potatoes or peanut oil? Actually, I do not know; nor do I care. I began by squaring off three Yukon Gold potatoes and cut them into 3/8" rods using a fry cutter called 'a sharp knife'. (The choice of Yukon Gold was arrived at when I opened the pantry and found some left over potatoes from Christmas Eve.) These were washed in ice cold water until clear and transferred to the fridge. Now these fries cannot be confused with Fast Food because it took over 10 minutes to heat the peanut oil to 325 degrees. I the cooked the fries for about five minutes until the outsides were barely crisping and the insides barely translucent. Upon holding the fry, it was limp. (let it cool first.) These are then place aside in a bowl. The oil is then heated to at 375 degrees. The first batch I under-cooked because they mistakenly looked more golden brown in the fryer. The second batch I cooked for about four minutes and they were perfect; and I'm talking Celestial perfection. The fries are then drained on a deconstructed paper bag. The indigenous peoples of the Altiplano near lake Titicaca in Bolivia have been draining on paper bags for centuries as this is known to remove all of the oil from the potato thus rendering the fries 'fat free'. ** (or is it un-rendering?) After a light dusting from your salt pig, you eat. These can be perfectly paired with nothing, or not nothing. The extra raw cut potatoes can be stored in water and fried up in the morning for breakfast. Eat Better by calling your mayonnaise "aioli"
Better Eat quick, your fries are getting cold. * Now Gluten Free for people who don't actually have celiac sprue, but feel better when they don't eat gluten. **FDA disavows this claim as unsubstantiated. The experience of exhilaration felt while driving home in your wife's convertible roadster with the top down in 65 degree mid-December weather from your Velcade (chemotherapy) injection appointment which is then augmented by having the general euphoria that comes 8 hours after ingesting large doses of steroids (Decadron) which makes you slightly hypo-manic prompting the playing of rock music at level 11; way louder than either your wife or audiologist would allow. Finally spiced by the wearing of shades, fedora and a care-worn leather jacket with the setting sun scene in the rear view mirror. Speaking of Velcade, I have learned a few things about how best to receive it. First, and foremost, get it injected subcutaneously. It is just as effective and has less peripheral neuropathy complications. (see review on AmmyloidHope.org) Second, ask the nurse to inject it deep. The very first time I got it, the nurse placed the needle under the skin superficially by inserting the needle at an angle as she entered. This resulted in the drug both irritating the dermal layer of the abdominal skin and also getting absorbed into the skin lymphatic system. Within three days this caused severe skin inflammation with red-purple lines tracking to the groin where the now inflamed lymphatics drain. The next week I asked the nurse to push the 1/2 inch needle perpendicular to the skin and all the way to the hub. I actually grab my abdominal wall to give them a deeper target so that it doesn't hit muscle. It's almost painless. The area still turns faint red is is mildly painful to touch, but it resolves in a few days instead of two weeks. Since I often have a different nurse each week, I offer a gentle reminder before they take the plunge. We recently traveled to South Africa to Kruger National Park for a four day safari. Then it was off to Cape Town to experience the beauty and wonders of the southern most tip of the African continent. It seem a bit surreal that in the same year we have been to both ends of a continent that I never expected to visit in my lifetime. Tangier, Morocco and Cape Town, SA are as different as New Haven, CT and Lincoln, CA. The trip was magical. We were fortunate to have David and Natalie Boucher, (Maria Boatman's uncle and aunt) as our guides. They have traveled extensively to Africa as missionaries. We began in Kruger National Park, a game preserve, and stayed in the Skakuza Camp. It is fitting that Skauza has the phonetic ooZ in its name as we were literally in a reverse Zoo. We were in the cage with an electric fence keeping out the native animals. Everyone want to experience an encounter with a least one of the big five. Some visitors count themselves lucky to see more than one. We saw all five every day. In addition to these majestic beasts, we encountered numerous other mammals, exotic birds, giant reptiles.fascinating flowers and unique trees. It was a naturalist's dream. Our tour guide Knut and our safari guide and driver, Sam, made sure that we were up close and personal with the untamed world of Kruger. Each night we would return to our thatched roof bungalows, gates were closed and we were treated to traditional South African food which is a combination of British meat and potatoes and South African item such as meli pap (a corn based porridge served with tomato-onion sauce) bobotie (a meat casserole) Biltong (jerky) and Malva pudding for dessert. South Africa will be a trip that we will remember and cherish forever.